Lifting the curtain on the 2016 presidential, congressional, and marquee statewide contests–with an eye on the 2017 transition and what it means for regulation and legislation. Election prognosticators argue that the “holy trinity” of POTUS approval, Right Track/Wrong Track and Generic Ballot preference foretell the outcome in November. 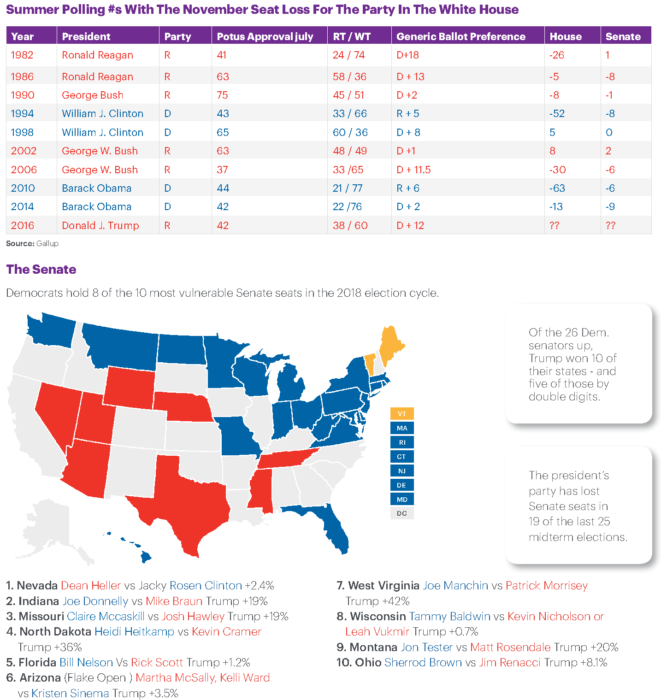 Looking back over the last 9 midterms, we see that presidents with a sub-50 percent approval rating lose an average of 40 seats in the House and 6 seats in the Senate. 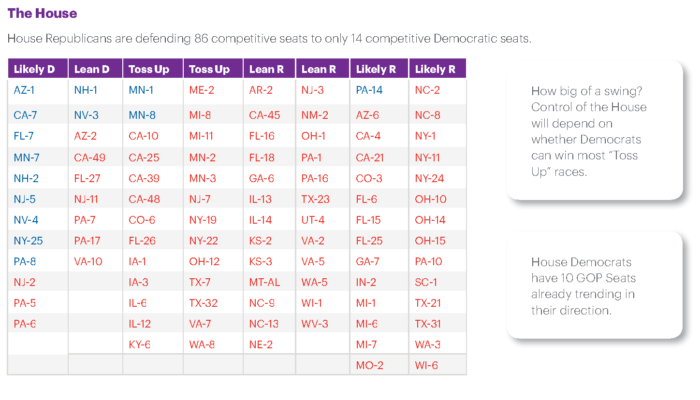 We also note that the summer Right Track/Wrong Track number seems to align better than the generic ballot as an early indicator of seat loss. Democrats in 56 House districts surpassed Republican incumbents in second-quarter fundraising, according to the latest Federal Election Commission filings. Sixteen of those House Republicans finished the quarter with less cash in their campaign accounts than Democratic opponents, while no Democratic members lag their Republican challengers in cash. There are 23 House seats held by a Republican incumbent that Hillary Clinton won in 2016: AZ-O2, CA-10, CA-21, CA-25, CA-39, CA-45, CA-48, CA-49, CO-06, FL-26, FL-27, IL-06, KS-03, MN-03, NJ-07, NY-24, PA-06, PA-07, TX-07, TX-32, VA-10, and WA-08. There are 12 House seats held by a Democratic incumbent that Donald Trump won in 2016: AZ-01, IA-02, IL-17, MN-01, MN-07, MN-08, NH-01, NJ-05, NV-03, NY-18, PA-17, and WI-03. So far in 2018, Democratic House primaries featuring at least one woman, one man and no incumbent, woman have woman in 70 of 106 cases (66 percent). One the GOP side, just 11 of 29 won (38 percent). Democrats have nominated women in 85 of 179 (47 percent) of 2018 House races, excluding incumbents. On the GOP side, just 24 of 139 (17 percent). The House GOP has 42 open or vacant seats, the most since the Gatsby Era: 19 Solid R, 4 Likely R, 7 Lean R, 4 Toss up, 5 Lean D, 3 Likely D.